Pocket PC to Mobile SMS Software send instant bulk SMS from Pocket PC/PDA device to individual or group of people at all national or international mobile network. PDA device group sms software enables you to deliver group text messages from all major windows based multimedia mobile phone to different mobile contacts without requiring any internet connection. Mobile messaging program provides facility to maintain a phonebook from where phone numbers are imported at the time of sending messages. Provides facility to send group text messages from Pocket PC/PDA device to other mobile phone instantly. Facilitate to send buk number of SMS at national or international mobile network. Provides option to maintain phone book to import phone numbers at the time of sending SMS. 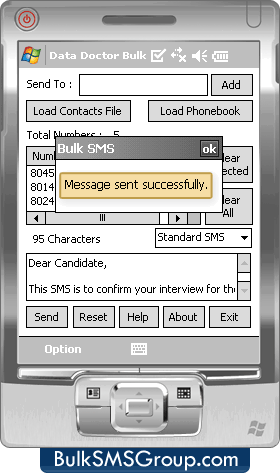 Generate sent messages report in TXT or CSV file format. Supports all Windows based Mobile Phones, Smart phones, Pocket PC, handheld PC PDA and devices.